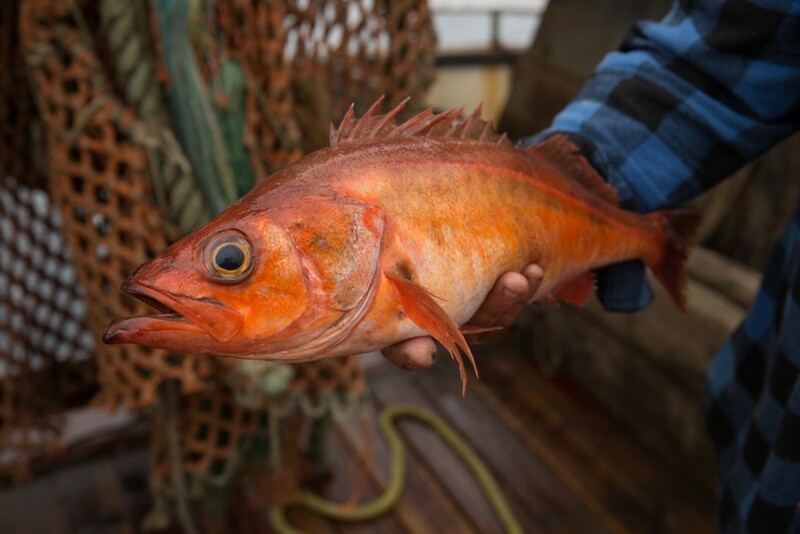 It may seem counter-intuitive that sharing the catch yields more fish and economic benefits for fishermen and coastal communities, but that is exactly what catch shares are proven to do. NMFS (National Marine Fisheries Service) recently released its first national report assessing the economic performance of catch share programs in the United States. This report further validates the findings outlined in a 2011 Marine Policy Paper, “Assessing Catch Shares’ effects evidence from Federal United States and associated British Columbian Fisheries (Grimm et. al), which examined 15 catch share programs in the U.S and British Columbia before and after catch share implementation. 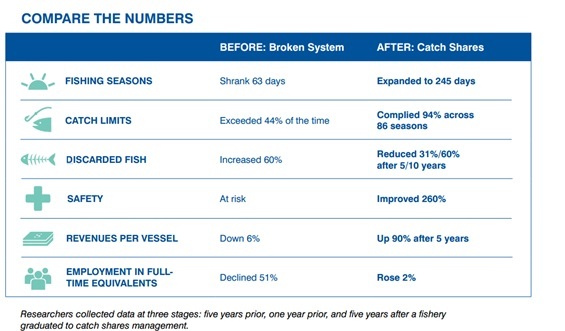 While these two studies differ slightly in selected fisheries, variables and time frame, they both conclude that catch shares consistently outperform conventional management systems across the board. Graduating to catch shares yields a robust return on investment: longer seasons, fewer risks, higher revenues, less waste and more full time jobs. An overview of the findings from Grimm et al. is presented in the table below. Regulations to restock fisheries and keep fishermen safe ought to go hand in hand. Unfortunately, in an effort to control how many fish are caught, regulators frequently impose rules that end up putting fishermen in harm’s way. 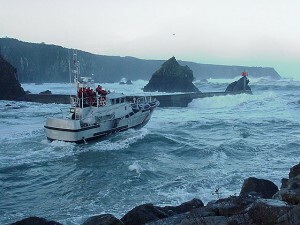 For instance, if fishermen are limited to a set number of days on the water, there is pressure to go out and stay out, no matter the weather conditions. This time constraint also makes it less likely that captains and crew will take safety precautions and get enough rest. EDF Oceans has joined safety advocates and families of commercial fishermen who have lost their lives at sea in signing a letter urging the National Marine Fisheries Service (NMFS) to ensure that rules to control overfishing do not result in unsafe conditions for fishermen. 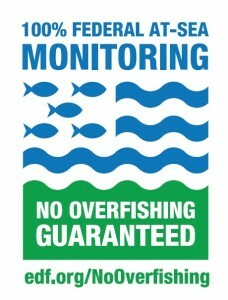 The Pacific Fishery Management Council took a significant step last week when they voted for the first time to move forward with a formal process to scope, set performance standards and eventually implement electronic monitoring for the West Coast Groundfish Individual Fishing Quota (catch share) fishery. Why is that important? 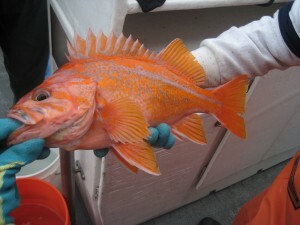 The West Coast catch share program is now in its third year of operation, and one of its chief characteristics is that it is “100% Federally Monitored – No Overfishing Guaranteed.” An authorized third-party observer who tracks the catch and ensures that all fish are accounted for accompanies each groundfish trip. West Coast fishermen are committed to the full accountability provided by observers, but they are struggling under the added costs that the federal monitoring requirement places on them. Electronic monitoring is seen as a way to save on costs, increase fishermen’s ability to time their trips to weather conditions and market opportunities, and improve safety. That’s why EDF has been working with fishery managers, fishery enforcement personnel and NMFS to encourage development of cost-effective ways to gradually replace human observers with onboard cameras and supporting software systems. Last week’s Council vote was a milestone, and EDF joins with West Coast fishermen in thanking Council members for taking this well-considered and vital step. In a long-awaited decision, the 1st U.S. Circuit Court of Appeals has upheld a 2011 lower court ruling confirming the legality of the NE sector program. Ruling on a suit brought by the ports of New Bedford and Gloucester, as well as fishermen and fishing groups, the justices determined that the NE sector program form of catch share complies with the Magnuson-Stevens Fishery Conservation and Management Act and the National Environmental Policy Act. 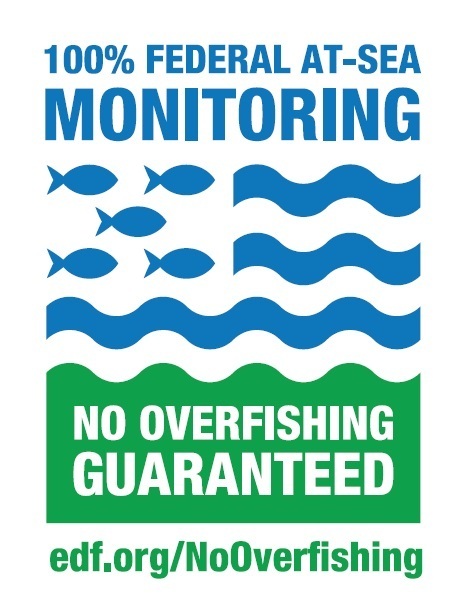 The court found that the National Marine Fisheries Service (NMFS) had adequately considered the impact of the program and taken the proper steps to accomplish its goals, including environmental conservation, increasing economic benefits and holding fishermen accountable for staying within catch limits. The three judge panel noted that, rather than destroying smaller business, many believe the new rules provide better protection. The judges also said federal regulators installed the law properly. “The Secretary (of Commerce’s) judgments here were derived from the record, rational, and not based on any error of law,” the court wrote. Read the full opinion here.